Total Built-Up Area - 2695 Sq.ft. This uniquely oriented house has two parts to it which are bound together with a common deck space which leads one to the small plunge pool for the family. One part of the house accommodates two bedrooms with an attached bathrooms, whereas the other side of the house includes more formal spaces, like the living room, dining, kitchen with attached store room.The house has got quite an unique entrance with a one car park space and it really makes a new twist to the entrance of any house where you do see the living room main door of the house but cannot evaluate the overall scale of the house unless you make your way thorugh the rest of the house. 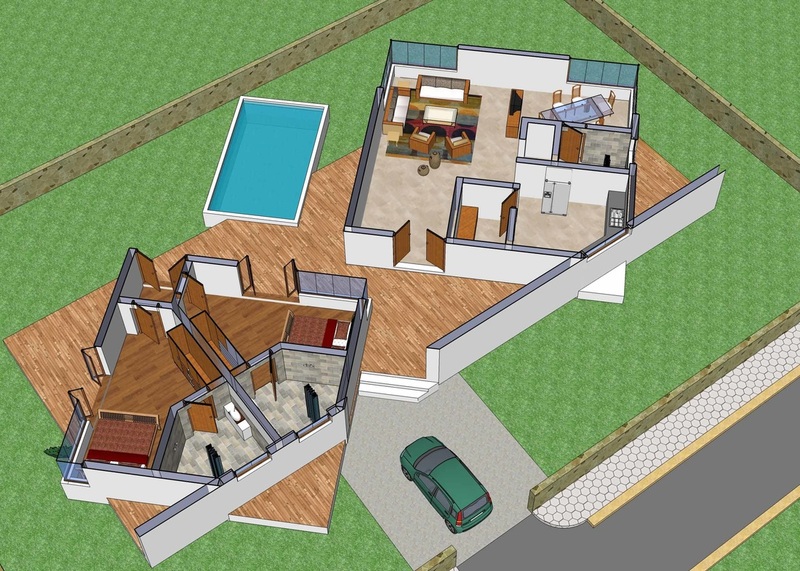 The unique angle of orientation of the room and placement of rooms tucked along with a pool makes it quite an opposite house floor plan than what is traditionally expected of a any house plan. So this design is very special and does need a open mind with a sense of adventure for any client to build it.